India’s one of the finest theatre institutions, very well known Theater & Media Center, with its repertory, is ready to perform two interesting productions with its high entertaining values and dramatic concerns. Mahemano O Vhaala, written by famous playwright Res.Lt.Shri Hasmukh Baradi and directed by Janak Raval & Naishadh Purani, highly acclaimed by class and well received by mass will be staged once again to invite you to a delicious journey of a couple who wants celebrate their fifth wedding anniversary with you. Knock on their door. They are waiting for you. 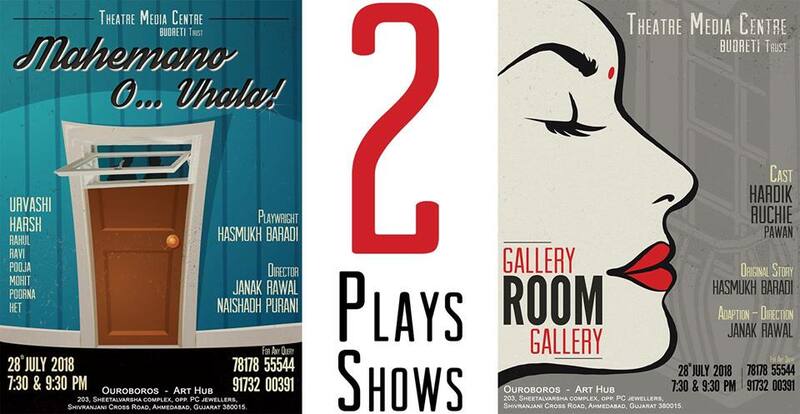 Gallery Room Gallery is adapted and directed by very experienced and known director of the city Janak Raval from a story written by Lt.Shri Hasmukh Baradi with the same title. High intellect in script, dialogues, performances and in craft is the focal point of this sensitively narrated drama. The air passes by this gallery will surely fill up your rooms of heart with emotions. A laughter riot followed by sensitive concerns is must watch. Come also to watch extraordinarily energetic and emotional performances by Urvashi Shrimali, Harsh Dharaiya, Hardik Shastri & Ruchie Naik.